The Mil Mi-34 (NATO reporting name: Hermit) is a light helicopter designed by the Mil Moscow Helicopter Plant in either a two or four seat configuration for utility and training. It was first flown in 1986 and introduced to the world at the Paris Air Show in 1987. The Mi-34 entered production in 1993, and is capable of performing aerobatic maneuvers, including rolls and loops. Mi-34S - four seat production model powered by a 239 kW (325 hp) Vedeneyev (VOKBM) M-14V-26V nine-cylinder, air-cooled, radial engine mounted sideways in the fuselage, and equipped with modern avionics. A few aircraft were purchased by the Moscow police. Mi-34L - proposed version powered by a 261 kW (350 hp) Textron Lycoming TIO-540J piston engine. None built. Mi-34P Patrulnyi (English: patrol) - Police patrol version for Moscow Mayor Office. Mi-34A - Luxury version, intended to be powered by an Allison 250-C20R turboshaft engine. None built. Mi-34M1 and Mi-34M2 - Proposed twin-turbine, six-passenger versions. Mi-34UT - trainer with dual control. Mi-34V or Mi-34VAZ or Mi-234 - proposed version powered by two VAZ-4265 rotary piston engines. Mi-44 - proposed development with TV-O-100 engine and refined aerodynamics. 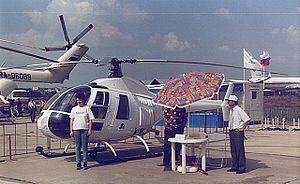 A mockup was built in 1987. Jackson, Mark. Jane's All The World's Aircraft 2003-2004. Coulsdon, UK: Jane's Information Group, 2003. ISBN 0-7106-2537-5.